Recently, Riviera owner Barry Cuneo shared his preventative maintenance tips routinely tested on his boat, Whirpool. Sailing since the age of 4, winner of state and runner-up national championships. Dual Sydney to Hobart and lifetime of sailing and boating. Son of 16ft Australian skiff champion, Tom Cuneo. Nephew of sailing Olympic gold medalist, John Cuneo. Professionally in Merchant Navy for 31 years, from Cadet to Captain, and Command of seven tankers up to 300,000 tons. 1993 youngest captain on highest graded ship (Ampol TVA) in Australia. 1996 Youngest Supertanker Master in the world on New Wisdom, 340m, 300,000 tons for French Company Total. 2000 made youngest Fellow of the Nautical Institute (London). Currently a Port Phillip Sea Pilot in Victoria. As a professional seafarer, I fully understood the advantages of the way Whirlpool was set up, however I also realized the responsibility that came with it – i.e. the need for an extensive and rigorous maintenance schedule to ensure systems operated correctly. This in no way is limited to this vessel – quite the contrary – every vessel, no matter how large or small MUST have a preventative maintenance schedule, designed to seek out problems prior to failure, to give confidence in operation at any time. Prior experience/maintenance schedules from system designers, previous owners/sisterships and knowledgeable colleagues (which can sometimes be variable in quality). Owners/operation and maintenance Manuals. A systematic “learning” process, gained by monitoring and testing, “non-critical” failures (i.e. something will always break or fail when you least expect it to), and basic common sense and good house keeping will generally minimize the effect. Spare parts/upgrades. When I bought Whirlpool, I was astonished to find a myriad of spares, from the basics right through to extensive engine/pumping and electrical spares. One must be able to understand their own boat’s basic systems, so that they have a good chance to get her home or to a safe haven at times of failure – no matter what the age of the boat. 1. Prior experience/maintenance schedules from system designers, previous owners/sisterships and knowledgeable colleagues (which can sometimes be variable in quality). Owners/operation and maintenance Manuals. Always hound all previous owners for their experience. Once the vessel’s title has been ceremoniously passed to you, it is amazing how much worthy information is forthcoming – some you will not like to hear, but take it all in, good or bad, and learn from it. All boats have their idiosyncrasies, you will learn at some stage – better to know straight away. It may be as simple as oil consumptions or water usage at particular revs – or even useful additives when filling diesel (I always use Fueltreat – it was on the boat when I bought it, and the CATS love it). Sisterships are an excellent source of information. I was lucky to have an exact same vessel berthed next to me at St Kilda – we bounced fuel figures, speeds, antifouls etc etc off each other. It is amazingly helpful to have solid comparisons to multiply your wealth of knowledge. Keep her Clean! Simple washing and cleaning, greasing and oiling are integral parts of a happy boat, and even happier owner. Salt is a killer – we all know that, but how many of us really appreciate how we can increase longevity of systems – and general aesthetic quality, by simple washing? Two of the most useful systems on Whirlpool are the desal (120L/Hr) and the fixed pressure wash system. I fitted this from sourcing parts at Riviera (Jason, the spare parts guy, is a champion!) and it has changed the whole appearance of the boat. Some simple tricks of the trade…..Go to your nearest autoshop and buy a couple of spray bottles of Rainex. We use it on all our Pilot Boats on all windows. Whilst underway, I rarely – very rarely use the windscreen wipers on the glass. So little use have the wipers had, that they were frozen when we got to Riviera for the refit! I didn’t even know – or care. Please, do not use Rainex on clears! Only use a wash/wax on your gelcoat – never a harsh detergent without wax. Never allow the gelcoat to become chalky – the superyacht skippers tipped me off to use autoglym between professional polishes – it keeps a significant coating to eliminate salt ingress. 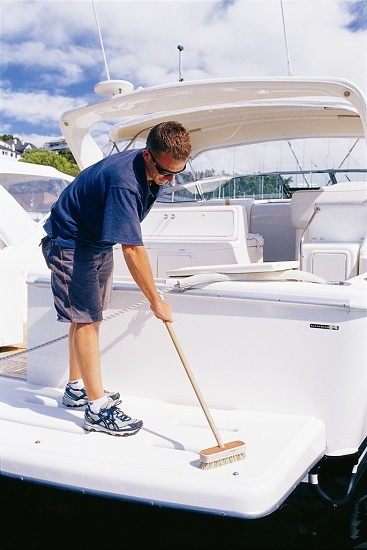 By washing the boat after use and regularly waxing, the luster and polish will never fade. People have asked how we keep the teak deck so perfect. Well…(thanks Glenn…I listened and immediately started a system of laundry powder across the grain – with copious quantities of salt water, then an oxalic acid solution rinsed thoroughly with salt water. Off the shelf magic products just don’t work like this simple method. I took about 3mm off the deck in 2007 with a sander – be careful, but it does give the deck a new lease of life. There is a total of 12mm to work with and the caulking (sika) is only to partial depth. All stainless products – well I have tried them all – and spent almost as much as I have done on fishing lures! Simple is best – again a superyacht skipper enlightened me on using 3M cleaner and wax – not great for polishing fiberglass – but superb on stainless! It is a lot cheaper than the specialized products as well. 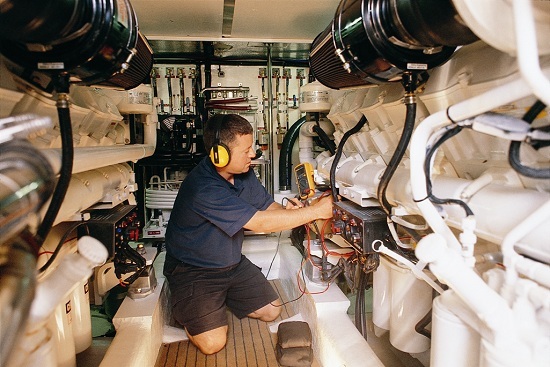 When leaving your boat for any period, you should ensure that the engine room is water and salt free, and that your engines have a fine mist of WD40 or equivalent. It stops rust and retains the value. In turn, the boat WILL look after you! 2. A systematic “learning” process, gained by monitoring and testing, “non-critical” failures (i.e. something will always break or fail when you least expect it to), and basic common sense and good house keeping will generally minimize the effect. A good example here is the consumption rate of anodes in your engines. Some owners don’t even realize they have some – my CATS have 12 on each engine! Careful monitoring over a period will show you when to change these – mine are between 8-12 months for failure, so I replace them at 6 months. If they are left too long, they will break off and inhibit your cooling systems. Replace them too early, and you are flushing money down the drain. If they are not sacrificing, I strongly suggest you get an expert to find out why, as you may have a major corrosion problem elsewhere. I was told that “oil and filters are cheap….engine failure is very expensive”. This speaks for itself. I change the oil every 100-150 hrs or maximum 12 months. Same with filters. An SOS test through Caterpillar will give you an independent opinion on the health of your oil/fuel/coolant and engine – all for about $30 a test. Desalinators are also an item which requires careful attention – especially if not used often. Read your manuals and look closely at the maintenance intervals and schedules. All Rivieras come with extensive manuals for every system. I was fortunate to have had a very conscientious previous owner, who had retained every piece of documentation. If something is missing, most times it can be easily found on the internet. Don’t mess with service intervals. It is a basic rule of preventative maintenance. 3. Spare parts/upgrades. When I bought Whirlpool, I was astonished to find a myriad of spares, from the basics right through to extensive engine/pumping and electrical spares. One must be able to understand their own boat’s basic systems, so that they have a good chance to get her home or to a safe haven at times of failure – no matter what the age of the boat. Especially when one undertakes a long or arduous voyage – i.e. Bass Strait or Northern Trek, the vessel may have not been used to this type of action. Simple rolling and change in temperature are enough to spark systems into failure. 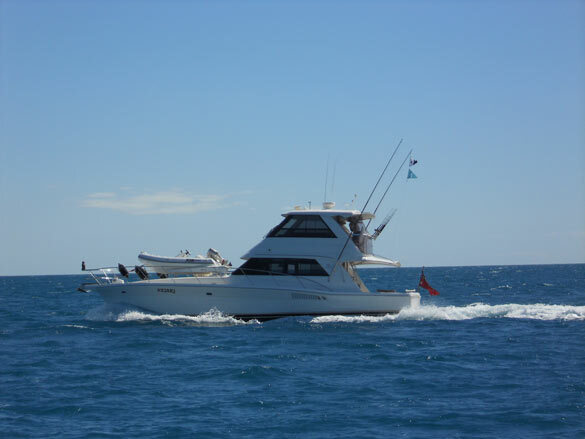 One of the greatest myths in boating is looking for low engine hours to identify a “good, healthy and reliable boat”. Reality is usually quite the opposite. Synthetic, rubber, metal and oil surfaces are designed to work. Diesel Engines are designed to run – on load. Any vessel with an average of less than 100 hrs per year of age must be looked at very critically for possible failure in critical systems. O rings, flanges, seals and pump diaphragms, sitting in one position for long periods WILL prematurely fail when eventually put under load. Generators are another area for careful attention. Most day boats use shore power for the majority of the time. When the generator is used, the load is generally light. I bet some of you wonder why the gennie blows smoke, yet the main engines seem quite happy! It is all about load. Whenever you run your gennie, always make sure you give it plenty of load, even you are not using the particular system. I always try to run the A/C, just to give it the load. Just look at a prawn trawler sitting at anchor – have you ever wondered why they always have their big deck lights on? Whirlpool has had two refits. The first, by Jeff, was at her fifth birthday at Riviera, and she has just completed her second, at 10 years at Riviera Aftermarket and Service facility prior to departure in Melbourne. I find it difficult to understand why so many boats look run down, when it really doesn’t cost very much at all to update and replace prior to deterioration or failure. It seems many are more interested in changing their cd radio to an I-Pod compatible rock box, before changing the A/C seawater suction hoses, or other simple, but critical system components. Simple upgrades, such as renewing toilet seats, changing the carpet, and renewing clears will enhance your boat’s luxury feel, as well as retaining its value and modern feel. We like to use and feel our boat, so would rather replace the carpet after a period of use, than cover it and never see it, in fear of damaging it. Rivieras are a complex community of many systems, designed and installed to work in co-operation with each other. In a perfect world, this would be seamless, however we must be critical at all stages of the vessel’s operation to verify the integrity of anything which is – or should be operating at any one time. (also if something is operating when it should not be! – i.e. bilge/water pumps). What are some of your boat maintenance tips? We’d love to hear from you! ← Wrap on the Yacht and Brokerage Show in Miami. Ole!